How are you watching the Winter Olympics? Recent research into Winter Olympics watchers have found that they’re big fans of the digital world, too – with 35% of consumers now watching the content online. The study by Global Web Index highlighted the potential for attracting these sport fans online, with YouTube and Facebook proving to be the most visited/used platforms amongst the 30,755 Winter Olympics watchers that were polled. The research found that these snowy sport fans spend 2 hours and 24 minutes a day on social media. However, contrary to the beliefs of many industry experts, Instagram and Twitter were significantly lower in popularity than Facebook – with this perhaps related to them being less associated with live streaming. Check out the rest of the stats on Net Imperative. For businesses, the stat that may matter most is that 28% of Winter Olympics fans are looking specifically for products to buy when they are second screening – so we should be looking to inspire these second screening sports fans in order to boost conversions at this time. In a bid to cull the number of bot accounts on its platform, Twitter has begun a cut-throat purge to clean up its act and fall in line with recent moves to banish inorganic, or even harmful, activity. However, the move has caused dozens of users to have their accounts suspended until they verify their identity by phone – leading to the hashtag #TwitterLockout trending. With many conservatives and right-wing advocates receiving the verification request, Twitter is now facing allegations of political bias following the crackdown. “Twitter’s tools are apolitical, and we enforce our rules without political bias,” the social network has said in response, while a professor from the University of Oxford told the BBC that the divide could just be evidence of the different news sources left and right-wingers prefer. As someone who browses Twitter regularly and has a journalism background, I’m all for free speech. However, there’s an argument that, if you are a real person, then surely you have nothing to fear from verifying your identity and resuming activity as you were. I don’t know about you, but I don’t need a feed, or a following, packed full of spammy bots. Is the Bitcoin boom nearing its end? Whether you’ve already invested, have a morbid curiosity, or are convinced it’s a Ponzi scheme, cryptocurrencies have hit the mainstream in the past 6 months – and now MPs are taking notice. An inquiry has been launched into the risks and benefits of this type of currency, and will seek answers around whether they’re capable of replacing traditional payment methods, and whether regulating them will improve consumer trust. It will also look at how other countries are approaching the cryptocurrency boom. Mark Carney, a Bank of England governor, told the BBC that “Bitcoin had failed as a currency”, but that some good could come from the tech behind the money. Many of the ‘against’ camp use factors like the lack of regulation and protection for investors to back their claims that cryptocurrencies are to be avoided at all costs. But that’s not the only side to the argument. Our Client Services Director, Mersudin Forbes, said: “As with normal investments, investing in cryptocurrency carries risks. Bitcoin has seen a massive rise because conventional investment firms have jumped on the train, but crypto billionaires have turned into millionaires overnight due to the volatility of the current currencies. Ad-blockers are portrayed to be the mother of all digital sins – but a new study by Global Web Index has found that actually, millennials who use ad blockers are more likely to pay for content than those who don’t. Although they like to have control over their online experience, these 21-34 year olds are happy to splash the cash on digital content on a monthly basis. Check out the article on Net Imperative for more details. 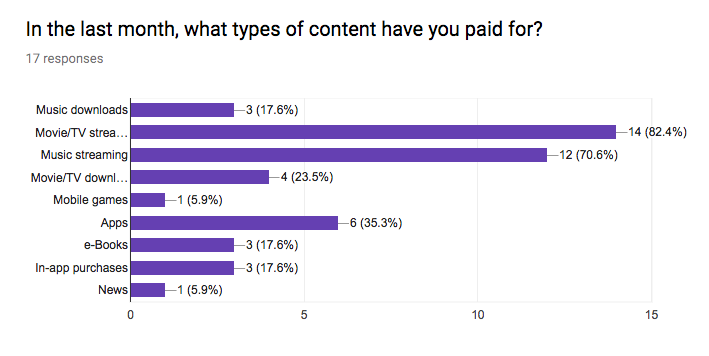 I polled our millennial GIANTs to see if they agree with the study, and found that most of the group pay for multiple types of content regularly. A whopping 88% pay for content regularly, while only 52% use ad blockers. Movie/TV streaming services, like Netflix, were the most popular paid for service, followed by music streaming sites like Spotify. A potentially unlikely partnership has recently formed between the UK government and Church of England, in order to use churches to improve Wi-Fi connectivity, broadband and mobile services in rural communities. To do this, wireless transmitters will be fitted to church spires and towers, with aerials, satellite dishes, and fiber cables placed in church buildings. Take a look at this week’s article in The Verge for more information. Rev. Stephen Cottrell, Bishop of Chelmsford, said that “encouraging churches to improve connectivity will help tackle two of the biggest issues rural areas face – isolation and sustainability.” One of our (many) in-house nerds, Sam Caesar, highlighted that as part of the directive, parish staff will be receiving training in diagnostics and development, in order to develop and progress ongoing digital infrastructure projects. “Perhaps your next call to tech support will be answered by a holy man?” he mused. If you were one of the 1.2 million people that signed a petition begging Snapchat to revoke its recent redesign, then prepare to be disappointed – as a bolshy Evan Spiegel has said the new look is here to stay. Spiegel was quoted in the Guardian as saying the old format meant that the “awesome publisher content was all the way down at the bottom”, due to it prioritising content from a user’s friends. Now the curation process will change, with an algorithm filtering the Snapchat product and using machine learning personalisation to predict past behaviour – and distinguish between friends and publishers. Now people are leaving the app in droves, including Snap-happy Kylie Jenner and YouTubers like Marques Brownlee, who said that the app should either focus on the personal peer-to-peer aspect people love, or work to improve individual discovery – and make it easier to discover new people making great content.